Monday Mole Madness. I've been challenged by Becca at Indi Chocolate to come up with a recipe using their Chocolate Mole Rub each Monday for the next six weeks. Becca is doing the same. If you are into mole, please join me and help me win this challenge by liking, commenting and sharing! Here's my first recipe for Monday Molé Madness! 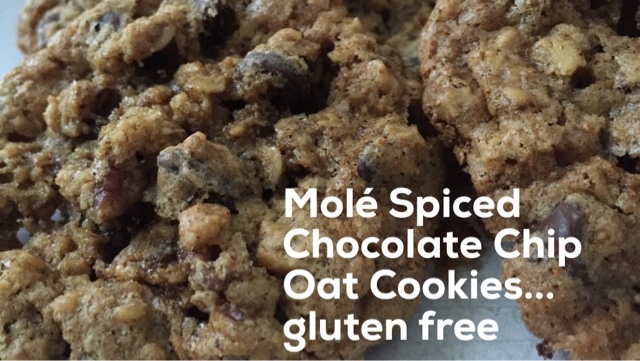 Gluten-free Molé Spiced Chocolate Chip cookies with pecans using Mole Chocolate Spice Rub by Indi Chocolate. The cinnamon and spices cut the sweetness and give depth to the flavor. I hope you enjoy them as much as I do. Resources below the recipe. Drop big heaping tablespoonfulls onto cookie sheets. Bake at 350 degrees for about 12 minutes. *If you don't have oat flour on hand just blend the oats in your blender. You will have oat flour in about 15 seconds.